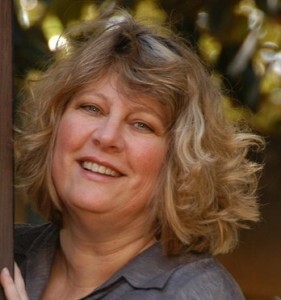 DearEditor.com’s Revision Week continues today with Robin LaFevers, the author of fourteen books for young readers, including the Theodosia series, the Nathaniel Fludd, Beastologist series, and the much buzzed-about new His Fair Assassin series. Please join Robin and The Editor for Day 3 of Revision Week, and find out how to win today’s “Free Partial Edit”from The Editor. Robin LaFevers was raised on a steady diet of fairy tales, Bulfinch’s mythology, and 19th century poetry, so it’s not surprising that she grew up to be a hopeless romantic. She has also spent a large portion of her life being told she was making up things that weren’t there, which only proves she was destined to write fiction. 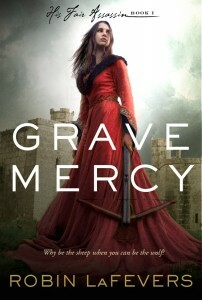 Robin’s most recent book, Grave Mercy, is a YA romance about assassin nuns in medieval France and has received three starred reviews and is a 2012 Indie Next Spring Pick. Robin was writing the final words of Grave Mercy’s follow-up (Book Two in the His Fair Assassins series) when The Editor asked her to participate in Revision Week. Robin steadfastly refused to answer a single question until she’d typed “THE END” on the draft for her editor. How’s that for maintaining focus?! Thankfully, Robin made her deadline and is now free to share her hard-earned insights on the revision process. *After Robin’s interview are instructions for entering today’s Free Partial Edit Giveaway. You jokingly dubbed yourself the Queen of Multiple Drafts. How many drafts does it typically take before you feel confident about the character and story choices you made? Oh gosh, that really depends on the book and how long it’s been percolating in my head! Since I tend to divide books into acts, my process usually involves working on act one for a number of drafts—four to five at the least, although sometimes it can be upward of seven. In those revisions, I really work on nailing down the character’s voice, the tone of the story, the world, and the major components of the character’s internal arc—what they think they want vs. what they need, the whys of all that, and then trying to understand and brainstorm what keeps them from achieving that. I can’t move on in the story until I get all that figured out. 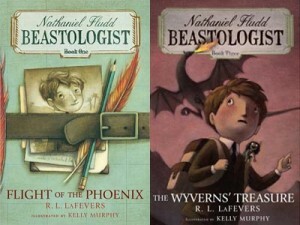 With the Nathaniel Fludd, Beastologist books, I did a lot of that in my head before I ever set pen to paper, so only needed a two or three drafts. With Grave Mercy, I worked all that out on the page in a daunting number of revisions. When I do it that way, I find the rest of the book requires fewer revisions—maybe only three or four. And of course, once I reach The End and have the entire book complete, I have to go back and massage the first act so it all fits together, which is another revision or two. Do you go through fewer drafts when you’re a few books into a series? Yes, thank goodness! And that is because so many of the elements are already established—the character’s voice, the essential personality, the players, the world. That and because those are written on contract with hard and fast deadlines. Which draft gets shown to your editor? How much revising happens after the editor sees that draft? Which draft I show to my editor depends on whether it is part of a continuing series or not. I don’t like to write books on spec, so if it’s a new project, I will typically have as polished and perfect a version of the book as I can. Or as polished and perfect as I can make it at that point in time. A critical part of my process is letting the book lay fallow for a while between drafts. When I do that, I find my subconscious does a huge amount of the heavy lifting for me, which always makes things easier. So, for new projects probably anywhere from the seventh or tenth draft gets shown to my editor. For continuing projects, probably the third or fourth draft. Now, the upside to doing so many drafts myself is that I usually only have to do one revision for my editor, and usually a fairly light revision at that. For my most current project, the second book in the His Fair Assassin trilogy , I had to turn in a much earlier draft than I am used to and I have to say, it makes me hugely uncomfortable. Like showing up at a business meeting in my jammies. In fact, I was so twitchy about it that I sent along a copy of my revision notes—all the things I knew still needed work—to my editor, just to try and streamline the process and let her know I didn’t think all the manuscript’s bald spots were okay. I don’t use critique partners because it isn’t helpful to me to show my work while it’s in progress. I do use beta readers though (although that may be a matter of semantics) who read the entire manuscript and give me their thoughts. I find them to be enormously helpful. For me, beta readers are highly trusted readers (most often writers) who have similar reading tastes as I do and like/read in the genre that I’m writing. They are also, and perhaps most importantly, able to help me write the story I’m trying to write as opposed to giving suggestions on how to write it as if they were writing it—which of course would make it an entirely different book. That’s a really important distinction though, because oftentimes we can get too much feedback or feedback that is at crosspurposes to what we’re trying to accomplish. So I pick my first readers very carefully. I usually hand off the entire manuscript to these readers after a few drafts but before the final draft—that way the manuscript is still malleable in my mind and hasn’t “set” yet. Sometimes, if I get it all polished up and think of it as “ready”, making big changes can be too hard! Do you ever share your manuscripts with young readers to test them out? No, I haven’t really done that since my kids have grown up, but when they were little, I definitely used them for guinea pigs! Which taught me an important lesson: experiment with tenses and POVs in the early stages of a book—just don’t set your POV choice on default mode. When it is sent to the printer. Seriously. I could fiddle and tweak forever. In fact, I have been known to tweak and edit on a printed copy of the book before doing a reading. But there is a point where you aren’t necessarily making it better—just making it different. Or so I try to tell myself. Deadline: MIDNIGHT tonight, March 7, 2012, PST. Winner will be randomly selected using Randomizer.org and announced on March 8, 2012, in the DearEditor.com comments section and on the DearEditor.com Facebook page, and the winner will be notified directly via email. Robin, your determination and hard work are an inspiration! I have a copy of Grave Mercy for review (from Net Galley) and can’t wait to start reading it. Congratulations to the winner of yesterday’s Free Partial Edit Giveaway: Rick Starkey. Rick, I’ll contact you directly via email. Good luck to everyone with today’s giveaway. Wow! Thank you so much. What great news to start the day. Thanks for all these interviews this week. We need encouragement and all the help we can get. I often hear first person present is the way to go. I mostly do first person, past. It is like a whole new world trying to write in present tense, for me. I guess I should try a chapter or two. I love that advice to experiment with POV and tense early on. It seems like a lot of useful insights about the characters would come out during that process, as well. Fantastic interview! I love the Theodosia and Nathaniel books, and can’t wait to read Grave Mercy. Hearing about the dedicated revision process of one of my favorite authors is definitely inspiring. Thanks to The Editor and Robin! You’re welcome, Jess. I’m LOVING this week. I’m as fascinated as you are by these glimpses into their creative working! Loved this advice: “Experiment with tenses and POVs in the early stages of a book—just don’t set your POV choice on default mode.” Thanks for the guidance! Robin: Just wondering if you have a lot of stories percolating in your head at once, and how you manage to write the project you’re working on while keeping the others at bay. Your power of focus seems incredible! Dan, that has been a big issue for me! Luckily, I am not only the Queen of Multiple Drafts, but also the Queen of Multiple Spiralbound Notebooks. If I am not committed to a contracted project, I go with whatever idea is screaming the loudest. If I am committed to another project, I give the new idea its very own shiny new notebook. Then, at the end of the day when I have finished my ‘real’ project, I let myself play a little and jot down whatever new idea is nudging at me. It might be a snippet of dialog or a character sketch or simply a cool plot idea. I do that as long as it takes for me to feel as if I captured enough of the story idea that I won’t forget it, but always after I’ve completed work on my main project. I know, Robin! Sometimes I can’t figure out the second word myself. I’ve got to see if my webmaster can find me verification tool with easier-to-read words. I loved this interview and will have to go out and get Grave Mercy. My revision process is so very similar to Robin’s. I stand out in my critique group as the man with multiple, multiple drafts. I’m so glad to know someone else has a similar process. Thanks very much, Robin. These interviews are not just interesting, they are USEFUL. I’m eager to share some of these thoughts with other writers I know. I appreciate the reminder that we must discover our own ways of working and revising. How do we discover them? Well, by doing the work of course – but glimpses at others’ processes helps. Thank you! That cover is divine! Congratulations! Thank you. Excellent interview. I can feel the positive energy and am ready to go and tackle a revision. I’m also appreciative for the recommendations about POV and tense. Enlightening. these interviews are extremely helpful and informative. It is encouraging to know that published writers go through many drafts before they are ready to show their work and they often experience doubt up until publication. It seems that the stream of creativity keeps running, and one keeps thinking of another thing to add that would make it better. Robin & Editor – great interview! I read an ARC of GRAVE MERCY and absolutely loved it. The bummer about ARCs – I’m already looking forward to Book 2, and Book 1 hasn’t even been released yet! Ah well, the anticipation is sweet. So glad you liked it, Beth! I adored the interview today! 😀 I especially loved the insider info on how Robin revises, and that after a certain point, you aren’t making it better, just different. So true. Good luck on everything you do, Robin!